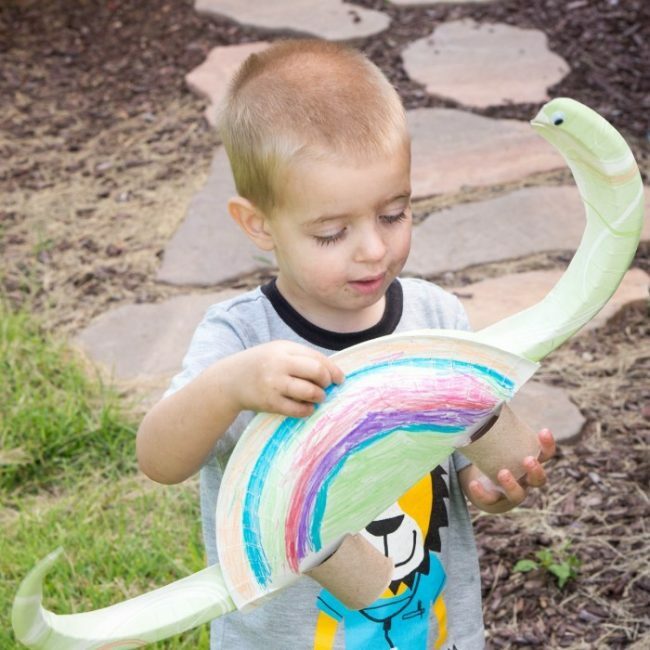 Learn about Dinosaurs with this fun, and easy, Paper Plate Dinosaur craft idea! You’ll just need everyday supplies you likely already have on hand to make this art with paper plates that doubles as a fun toy! Do your kids love Dinosaurs as much as mine do? 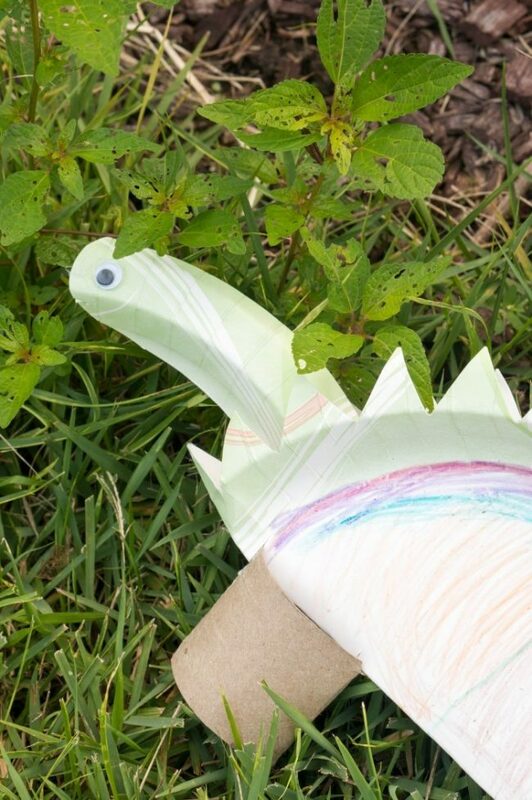 We’re making crafts with paper plates with this really fun, and easy, paper plate dinosaur craft! It’s a kid-friendly project they can make and then decorate with a little parental help with the glue gun. Affiliate links are included below. Watch us make this fun paper plate craft in this 1-minute video clip! Fold one paper plate in half, making the beveled plate edges touch. With a second paper plate, cut out a long neck following the lip of the paper plate using about half the paper plate. Round the end for a head and cut out a mouth. Use the remaining edge of the paper plate to create a long tail. Put the neck and the tail sandwiched between the folded sides of the paper plate body, then hot glue together. Cut an empty toilet paper tube in half. Cut notches by making 2 small cuts on edge, then folding down the tab created. Repeat until you have 2 tabs on each of the 2 legs. Add a dab of hot glue to each tab, and press the toilet paper rolls up onto the folded edge of the dinosaur, adding his feet. Glue on a googly eye and paint, if desired. Fold one paper plate in half, inside out, leaving the lip of the plate away from each other to create two rows of spikes down his back. Cut a zig zag pattern down both edges of the plate, creating spikes up his back. Use the scraps from the extra paper plate used to create the long neck to cut a tail and head. Glue together the back of the Stegosaurus and attach his head and tail. Cut out a mouth with a zig zag pattern, then pull the two sides slightly apart to form a mouth. Cut an empty toilet paper tube in half. Cut small slits in the paper plate body, and press the toilet paper roll legs up into the slits to attach. Attach a googly eye and paint, if desired. If you loved this fun kids activities and craft, you can find even more cheap and fun ideas here on A Mom’s Take! You can bookmark or pin this post to save it to easily find it again later or share with your friends. Do you have other ideas for another paper plate dinosaur? Oh my CUTE!!!!! I LOVE this idea! My son is obsessed with dinosaurs. Like literally right now he’s telling me I’m a dinosaur T-rex and I have to chase him. lol. Totally going to make these with him this summer. He’s not into crafts but I think he’d like this! What an adorable and fun art project! Perfect for family and play dates all summer long! I have a dino lover who is going to love seeing this craft! 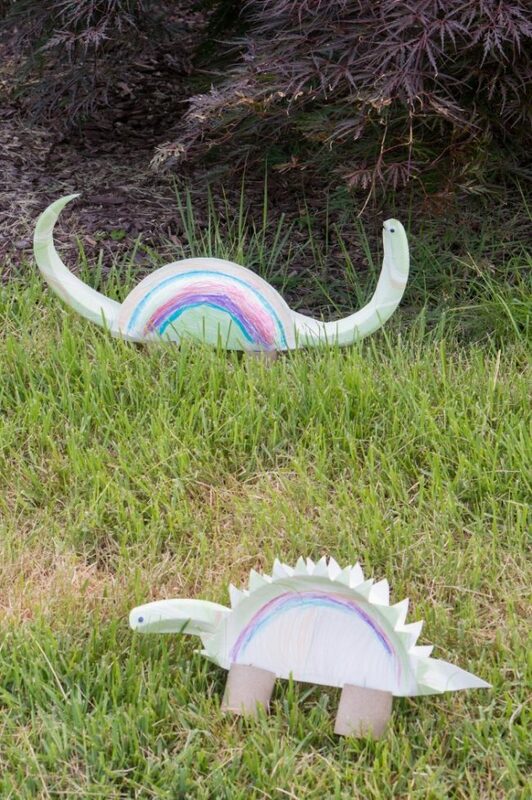 I think my yard will soon be full of paper plate dinosaurs. 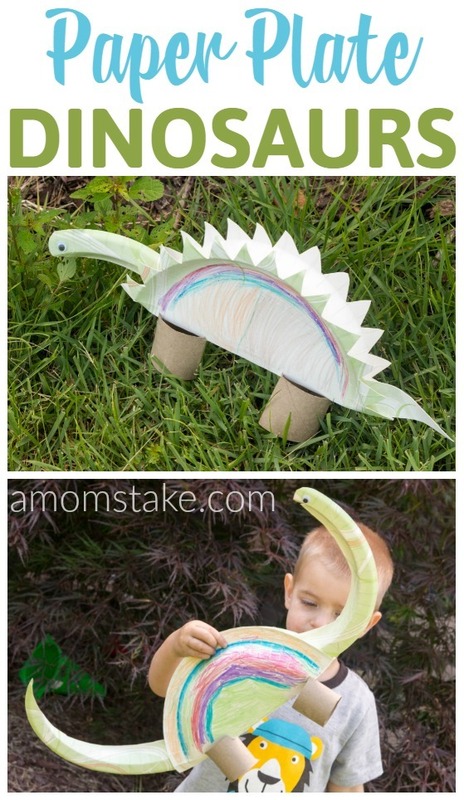 What a great craft idea for dinosaur loving kids. What a fun idea and I love the fact that I have all of this stuff on hand in my home, and NO glitter required! Paper plate crafts are so easy and fun for rainy day activities. My son loves them! This craft is really nice and easy to make. Thanks for sharing the details.